When sworn in as the 45th U.S. president last Friday, Donald J. Trump became the ninth commander-in-chief identifying as Presbyterian. While impressive, Presbyterianism claims the loyalty of fewer past presidents than the Episcopal Church, to which 11 past U.S. presidents have belonged. Methodists and Baptists followed close behind with a combined seven presidents. This reflects an important historical trend. 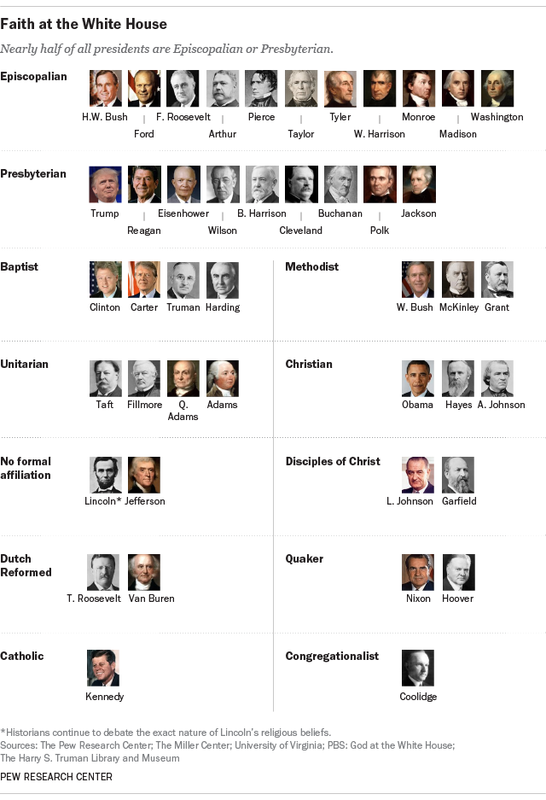 Nearly every U.S. presidents has identified as Christian, especially Protestant. Pew Research Center published a fascinating chart on Inauguration Day breaking down the religious affiliation of all U.S. presidents based on their religious affiliation. This breakdown demonstrates that 75 percent of presidents affiliated themselves with Protestant denominations. Not far behind the Episcopal faith and Presbyterianism come Baptist traditions (four presidents) and Methodism (three presidents). Two presidents each were Quakers, Disciples of Christ, and Dutch Reformed, while one president (Calvin Coolidge) was Congregationalist. Three more (including Barack Obama) identified as Christian, but with no particular denomination. John F. Kennedy remains the sole Catholic president of the United States. Although few Americans would flinch at voting for a Catholic today, Kennedy’s Catholic faith stirred controversy at the time. Even presidents who fell outside the boundaries of traditional Christianity generally maintained a semblance of faith. Only Thomas Jefferson and Abraham Lincoln failed to ascribe to any religious affiliation, although each demonstrated theistic tendencies. Four others followed Unitarianism, which always existed on the outer fringes of orthodoxy, but originally branded itself as a Christian denomination. Recently Pew also recently released data about the religious composition of the newly elected 115th Congress. Pew’s analysis demonstrated that more than 90 percent of congressmen and congresswomen identified as Christian. Similar to U.S. presidents, members of Congress most commonly characterized themselves as Baptist (13.5 percent), Methodist (8.2 percent), Anglican or Episcopal (6.5 percent), or Presbyterian (6.5 percent). Congress currently includes a much higher proportion of Catholics (31.4 percent). That amount of representation in Congress far exceeds the presidency. Diversity of religions in Congress also far exceeds that among U.S. presidents. Thirty-nine members (7.9 percent) ascribe to religions separate than Christianity, plus an additional 13 members (2.4 percent) who are Mormon. The most common non-Christian religion in Congress is Judaism with 30 members (5.6 percent). This is only my opinion, of course (and worth exactly what you pay for it) but I think most of the presidents of the United States have been thinkers and not merely reflections of other men’s thoughts. Which is another way of saying that although most of them were “affiliated” with one or another of the existing denominations, they were not “adherents” or “followers” of those denominations in the sense that some people are. I also think the decline in attendance at formal worship services is partly because people who read for themselves, study for themselves and think for themselves get tired of other people assuming that the thinkers’ affiliation with a religious organization is indicative of being merely a follower of a religious organization, a religious “creed” or religious “traditions”.